Sometimes you may wish a chart to retain information from when you last used it. AppStorage enables you to store information with the chart that is retained even though the chart is refreshed, turned off and on again or if the workspace is closed and reopened. 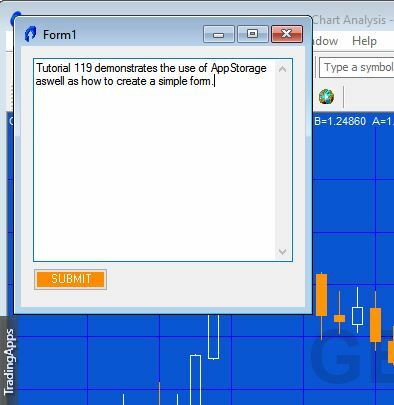 Tutorial 119 shows how to create a simple TradeStation indicator that uses a form to input some text information which is stored using AppStorage. 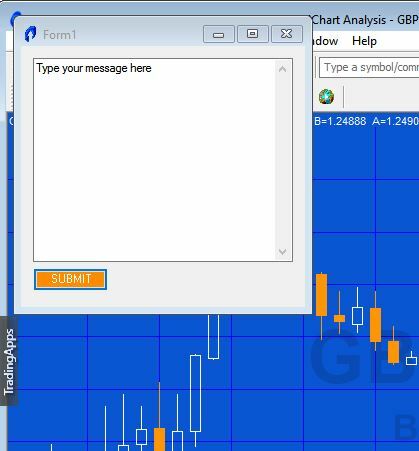 The user could enter information (perhaps something about future trading intentions or some insight about the symbol). This data is stored with the chart and can be read when the chart is subsequently accessed. In addition to storing text, the same principle could be applied to the positioning of a drawing object, i.e. 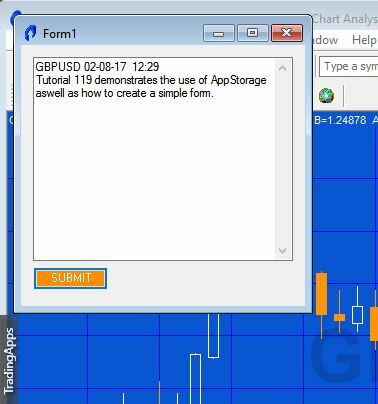 the last position where it was manually moved by a user could be stored in AppStorage and then retrieved the next time the chart or workspace was opened. In the tutorial, information entered using the form is stored in AppStorage and printed in the print log. When the program is initialized it is again printed to the log and displayed to the form. I have created a video below which describes how to create the program in some detail. If you would like to save yourself some typing the tutorial program is also available for download. After the submit button is pressed, the symbol name and date time are added to the text and the information is stored in AppStorage and appears on the print log. In order to simplify the tutorial, the program does not have any user inputs. The UNPROTECTED TradeStation indicator (_Tutorial 119) containing tutorial program (i.e. the TradeStation EasyLanguage is fully functional and you can see the source code) is available for IMMEDIATE download for $19.95- by clicking the ‘add to cart’ button. After download the programs can be opened, you will be able to see the program code and modify it if you wish. Note that the program name begins with an underscore.